Your weight distribution should be 50 / 50. 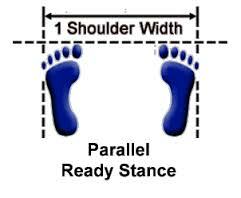 Place your feet one shoulder width apart from outside of the feet. 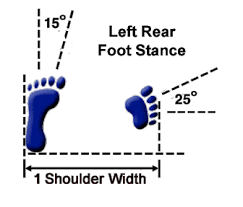 Place your feet one and a half shoulders widths wide between your big toes. 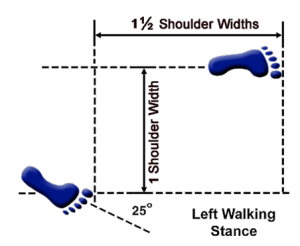 One and a half shoulder widths long from the footsword of the rear foot to the toes of the front foot, almost forming a right angle. 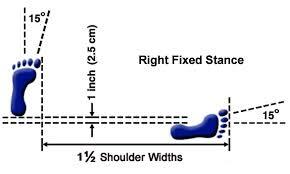 Place the heel of the front foot 2.5cm beyond the heel of the rear foot. The rear leg is bent so that the knee-cap is over the toes of the rear foot. The front leg is bent proportionally. 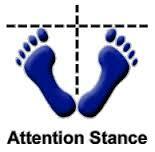 This stance is determined for the rear foot, and is always performed half facing. Bending stance is a preparatory stance for side and back kicks, and also frequently for defence techniques. The stationary leg bears all the body weight and is slightly bent. The other foot is placed at the knee. 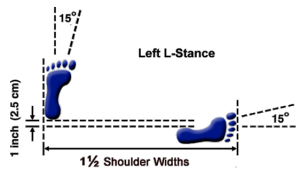 When standing on the right leg the stance is called a right bending stance, and vice-versa. It is performed either full facing or half facing. The rear leg is the primary leg. The weight is distributed 60% on the rear foot and 40% on the front foot. 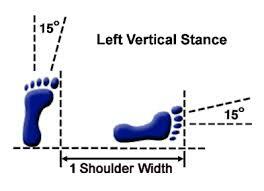 Both feet are turned inwards by 15 degrees Both legs are straight. This stance determined by the rear foot, and is always performed half facing. The stationary leg is kept straight while the reverse foot sword of the other foot is brought to the knee. 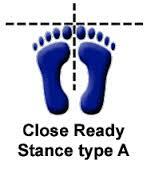 When standing on the right foot the stance is called a right one-leg stance, and vice-versa. It can be either full facing or half facing both in attack and defence. 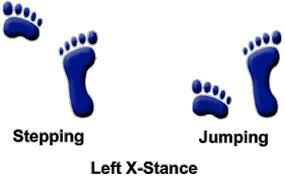 It has two significant variations, both of which cross the feet over in some way. Variation one is used for landing distance or height jumps, such as in patterns Yul-gok and Toi-gye. Though variation two is used for stepping sideways in a defensive position, such as in pattern Po-eun. The forward foot points outwards from the forward line, and the back foot is behind it on the ball of the foot. Both knees are bent and the back knee leans into the front knee. 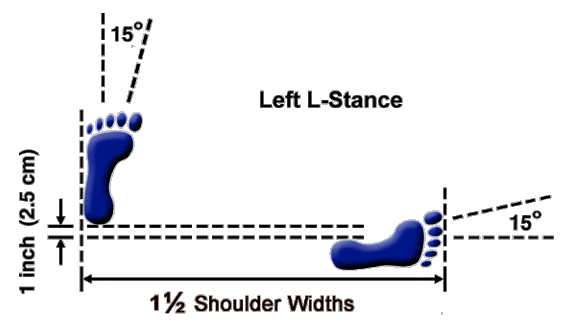 The weight distribution is mostly on the forward leg. In jumping, the forward leg of this stance is the leg that moves first.